Premiere Clip makes it fast and fun to create quality videos that can be easily shared — or easily opened in Premiere Pro CC for extra polish. 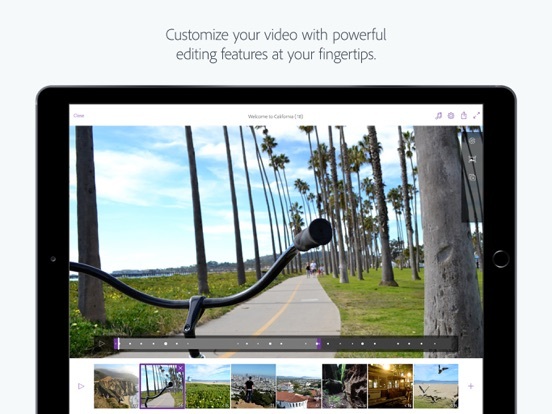 Drag and drop clips and photos in the order you like, trim out parts you don’t want, and add visual polish with lighting adjustments, transitions, slo-mo effects and more. 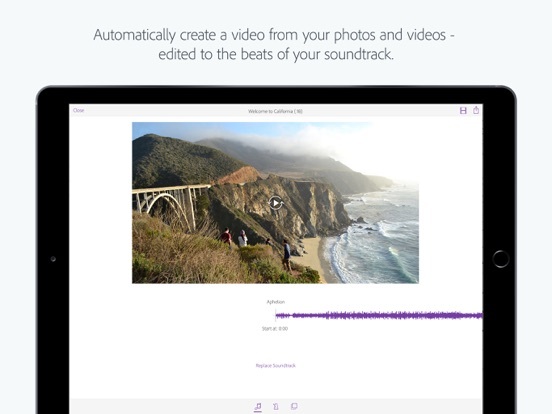 Choose from stock soundtracks, or add your own music. 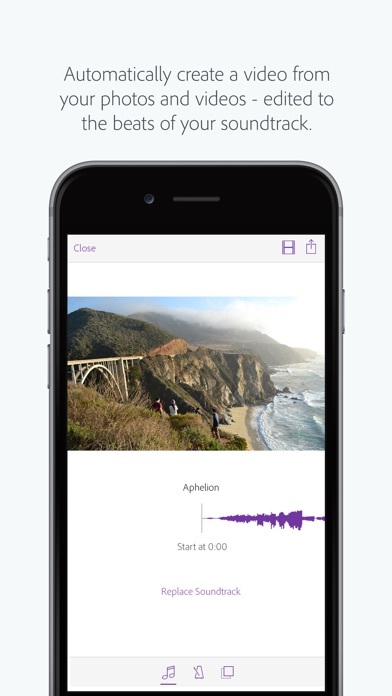 Smart Volume will smooth audio levels between clips, and Auto Mix dynamically balances soundtracks with your audio. 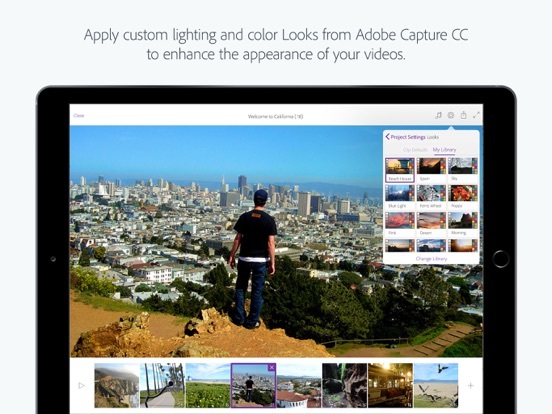 Apply custom lighting and color Looks from Adobe Capture CC to enhance the appearance and overall mood of your videos. 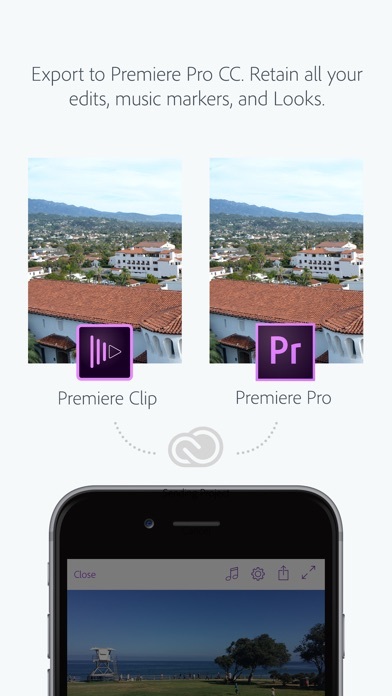 Save finished videos to your camera roll, post them directly to Facebook or YouTube, or send them to Premiere Pro CC for additional editing. 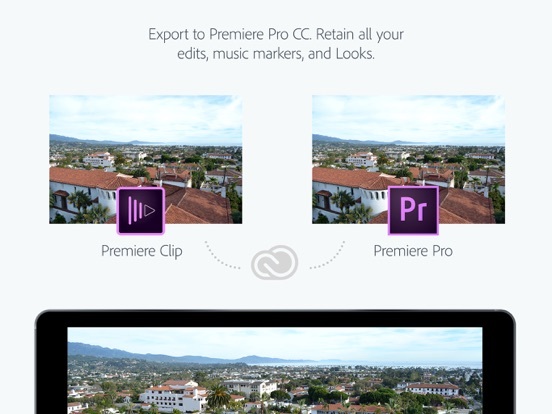 When you export a project to Premiere Pro CC, the edits, music markers and Looks you applied in Premiere Clip will appear seamlessly in your timeline. Adobe CreativeSync ensures that your files, fonts, design assets, settings and more all instantly appear in your workflow wherever you need them. 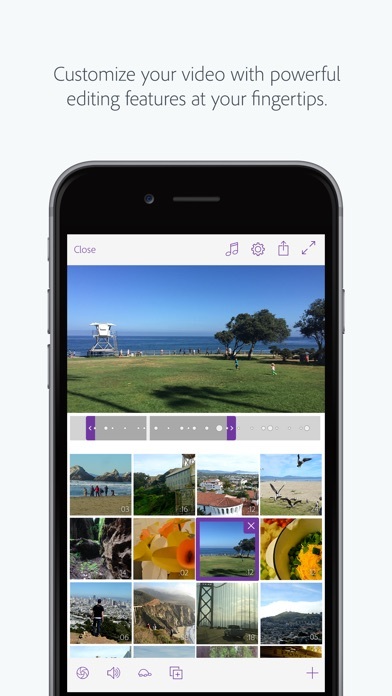 Start your creative work on any device and seamlessly pick it up on another. 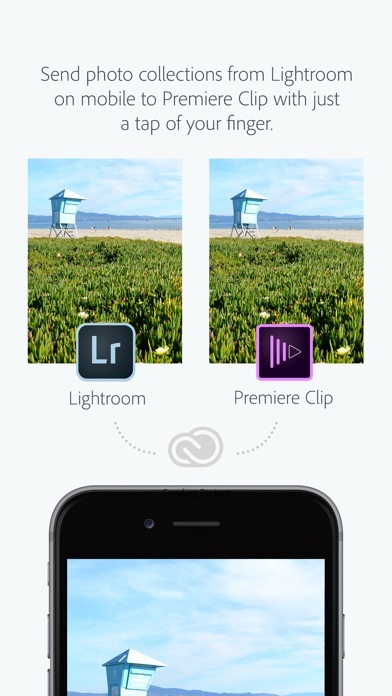 Adobe mobile apps work beautifully on their own, or in concert with each other and the Creative Cloud desktop apps. 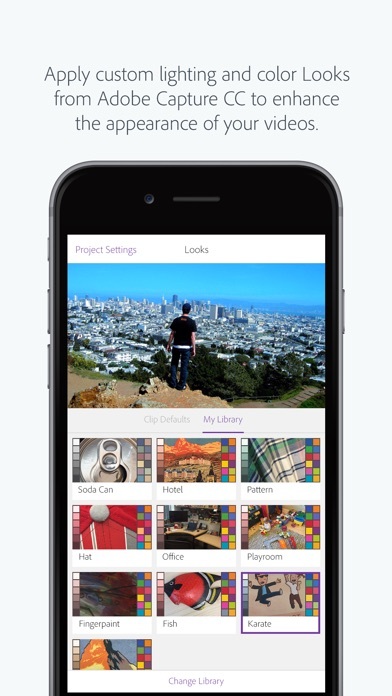 Use of Adobe mobile apps requires a free, basic level of Creative Cloud membership, which includes 2GB of complimentary storage for file syncing and sharing. 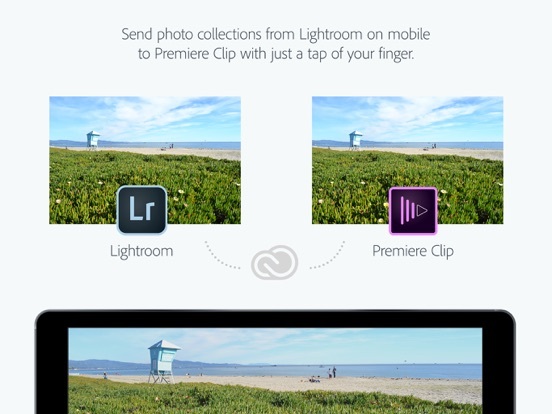 Video you capture on any external device can be saved to your Creative Cloud file storage and accessed by Premiere Clip. If you need more than your allotted 2GB of Creative Cloud file storage, you have the option of purchasing an additional 20GB for $1.99 (US dollars) a month. The recurring payment is automatically charged to your iTunes account. To stop service, simply go to your account Settings and turn off auto-renew at least 24-hours before the end of your billing period. Prorating is unavailable—when you turn off auto-renew, service will continue until the end of that month’s billing period. 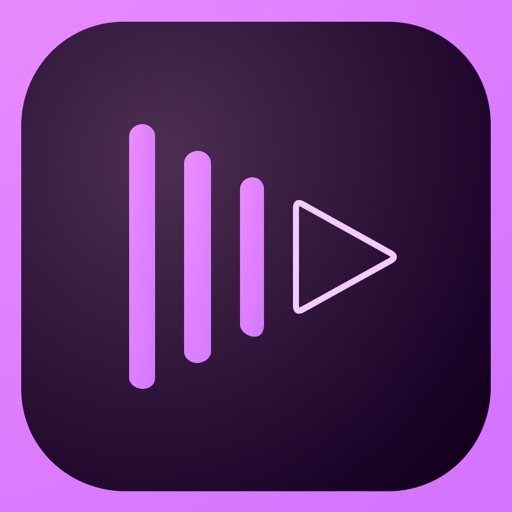 Adobe Premiere Clip makes it fast and fun to create quality videos that can be easily shared — or easily opened in Premiere Pro CC for extra polish.